It was our third trip to Thailand and this time we wanted to chill out for 10 days without doing anything, just relax around a pool and on the beach in beautiful places. We'd already been to Koh Samui twice, and we wanted to discover a new area so we picked Phuket. We hadn’t heard good things about Phuket, because there isn’t much to do there compared to the rest of Thailand, but when you just want to chill out the most important thing is being in a nice hotel, with a nice view and good services. 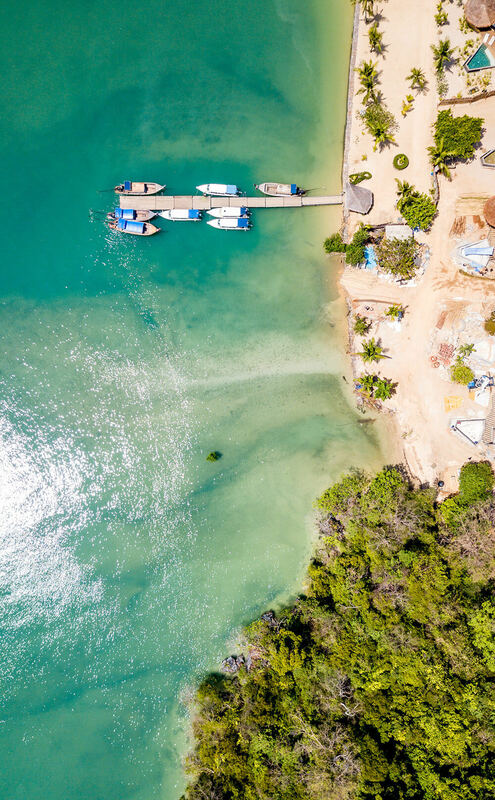 After some research, we decided to spend our vacation between the newest Treehouse Villas on Koh Yao Noi and the so Instagramable Keemala in Phuket. Phuket is the biggest island of Thailand. Koh Yao Noi is located in Phang Nga Bay between the islands of Phuket and Krabi and north of Koh Yoa Yai. After a long flight with a stopover in Abu Dhabi, we finally arrived in Bangkok then we took another plane to Phuket Airport. At the airport, a private taxi was waiting for us to drive us to the Marina where we had to take a private Speedboat transfer. Yes, sometimes you have to spend a lot of time on transport to get to special locations, where there are less or no tourists. The boat trip lasts 45 minutes, so that leaves you plenty of time to enjoy the Phang Nga Bay and its many islands! The moment we put our feet in the sand we were instantly disappointed with the hotel situation because we could easily see that the hotel was not completely finished. It was still under construction! Can you imagine? You come from far away to spend some time chilling out in a cozy place and you hear construction noises! The manager welcomed us and showed us the resort and all the facilities. In reality, we didn't want to stay, but despite being upset, we decided to go to our room. One that was almost finished and tried to take a nap, but we could still hear the work noises. We asked the manager to change rooms because we weren't satisfied at all. He understood our position and found a solution. 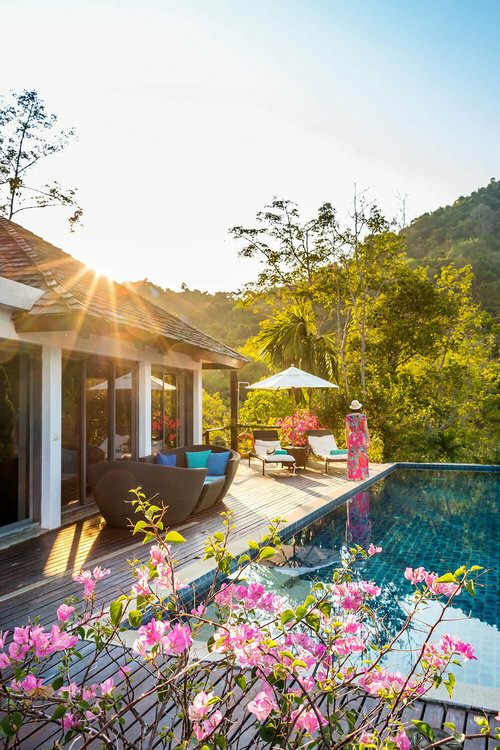 He offered us the chance to stay at the Pool Hill Villa of the Paradise Hotel which is the resort next to the Treehouse Villas and a 4-star more family oriented hotel. Thanks to him and his professionalism, we had a wonderful time in Paradise. In exchange for our little treehouse villa, we had a huge villa (270 m²!) on the hill with an infinity pool and an amazing memorable view. 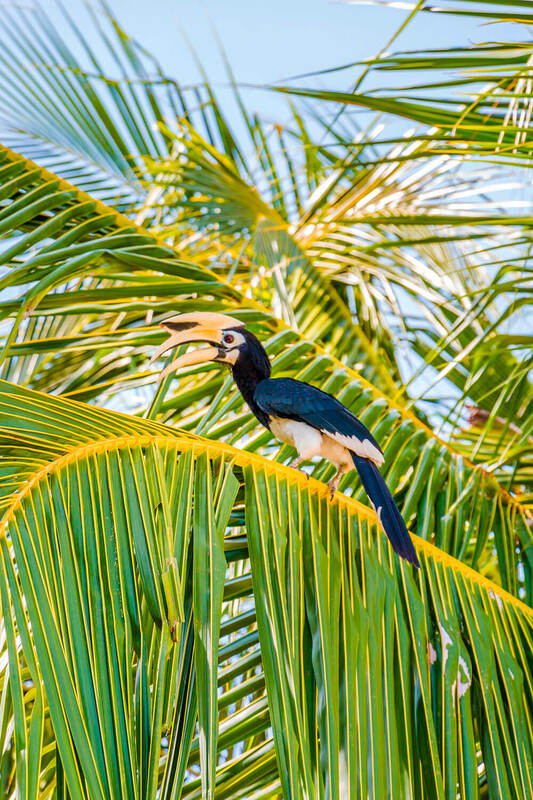 The resort was peaceful and nestled in a beautiful bay where many toucans make their home. The hotel has a spa that we used twice. The massages were delightful, done in a cabin in the jungle, which was pretty relaxing with all the sounds of the wildlife. You can also participate in a yoga class twice a day in a lovely beach house. I used to do a one-hour session per week but the class lasted too long, two hours and I wasn't ready for that. So I skipped it! The hotel offered some water activities such as kayaking to explore the coastline. We decided to go to Kudu Island 30 minutes off of the coast and it's worth it if you are looking for a little wild paradise. Don't forget to take some water and sunscreen! How did we keep to our vegan diet at the Paradise Hotel? The restaurants are on the beach and we had a romantic candlelit dinner there once. You can order Thai food or Western dishes on the menu and some evenings they offer a buffet. There is also a Mediterranean restaurant which offers pasta and fish, so for vegetarians and vegans the menu provides some options. The last night we were invited by the manager to try the new gourmet restaurant Roots at the Treehouse Villas. We had a tasty dinner, where we talked a lot with the young and creative Chef regarding our diet (vegetarian, vegan, dairy and gluten-free). He cares a lot about ecology and tries to use local products to create his dishes and minimize his waste as much as possible. He makes everything he can by himself from scratch, like his own almond milk. Even with the disappointing beginning when we arrived, we made some of our best travel memories in the relaxing hotel, chilling in the villa, taking in the sun, swimming and flying our drone in this paradise. We will come back for sure! For more information check out the website of the Paradise Hotel. Then it was back to Phuket, after 6 wonderful days in Koh Yao Noi, and we headed to the famous Keemala Hotel — part of the Small Luxury Hotels in the World — for our next four nights. The hotel is located in Kamala on the west coast of Phuket, close to Patong Beach. Our first impression when we arrived at the Keemala Hotel was 'Whoa, this is so amazing!’ Different kinds of villas are nestled in the jungle like in the photos we saw so many times on Instagram. They all seemed pretty! The second impression was not so good. The letdown this time came from the view, the ocean was far away and what we could see was spoiled by buildings under construction close to the hotel and big towers close to the beach. Thankfully, our stay was different! We chose the Clay Pool Cottage because of the price, the other villas were either fully booked or highly priced. We were lucky because it faced the jungle and not the ocean, so if you want to have a nice view ask for a rainforest view. Our room - #115 - was perfectly located, we loved the location, not too far, not too close from the swimming pool, the lobby or the restaurant. The cottage we booked was pretty, well designed and decorated with tribal motifs, without forgetting all the amenities. The bathroom was luxurious, and it included a bathtub in the middle of the room and an indoor and outdoor shower too! What else could we ask for? The terrace was a little bit too small, just enough space to put a sunbed. The pool was small too only 21m² so can’t really swim, but don't worry, if you want to swim you can go to the main swimming pool of the hotel. The villas are designed to keep the guests far from the noise pollution! We could only hear the jungle noises, and that's what we were looking for when we chose to stay at the Keemala. For your information, the other kind of villas is much bigger, and they include bigger pools facing the ocean. We went to the spa to pamper ourselves with a one-hour massage. It was delightful thanks to the professionalism of the massage therapists. They really helped us to relax, so we definitely reached our goal! We love the way the Keemala is engaged in ecology with their Commitment to Environmental and Ethical Practices. You won't find plastic glasses, bottled water or straws. Guest amenities are 100% natural, paraben-free and cruelty-free. They are running an organic herb and vegetable garden which they use in their kitchen. If you wander the grounds of the resort, you will stumble upon goats, peacocks, and ducks who were all rescued. They also have an anti-animal exploitation policy, that means they encourage guests to experience ethical animal tourism. If you want to read all their commitments, you can follow this link. How did we stay vegan at the Keemala Hotel? After chilling out, it was time to enjoy the cuisine that we heard was so fantastic, and now we can confirm that the food is insane, we probably ate one of our best Indian meals ever! From breakfast to dinner, everything we tried was so tasty, well prepared, well presented. The restaurant offers a large vegetarian,vegan, and healthy options menu for many types of diet like gluten-free or dairy-free. We truly were in another food paradise. We could go back again just for the food! We only went once to the beach by way of the free hotel shuttle. The surroundings and the beach area are not especially nice, the village is not worth it at all, so we decided to go back to chill out at the hotel. Whenever we go to Thailand, we always want to see elephants, not to ride them of course! So this time around we decided to take the time for that experience. 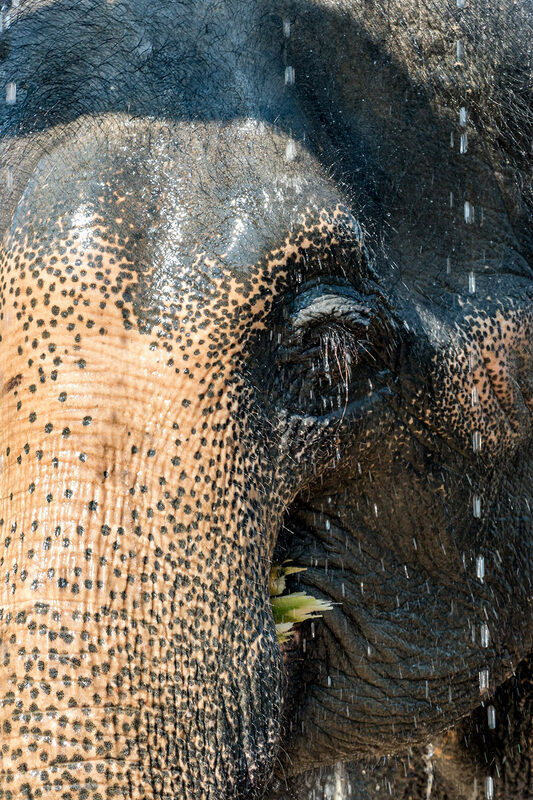 We took a half-day morning visit at the ethical Phuket Elephant Jungle Sanctuary (The price includes a hotel pickup.) Then you have about a one-hour ride to get there. On arrival, the guide gave us a lot of information about the behavior of the elephants, and why they rescued them from riding camps, shows or logger camps. We were affected by what the guide told us about their living conditions in Thailand. They are used for something they aren't able to do such as riding or working as a logger! After, we met a bunch of elephants with their Mahouts, the elephant caretakers. The Mahout is usually assigned an elephant when he is a boy. He will take care of him for his entire life. He teaches him almost 40 verbal commands to ensure their safety and that of the elephant. They build a strong relationship. We fed them banana and watermelon. These, not so little guys were so adorable! It’s astounding how you can see their intelligence in their eyes. We cuddled them as much as we could. It was so emotional. Then we accompanied them to the mud bath where everybody rubs them with mud just before their big bath in the pool. Everybody bathed and brushed them while they were playing in the water. It was so funny to see elephants rolling in the water like dogs! To end the experience, we followed them to the showers to clean them up. We wanted to make you aware of the Elephants because they are not designed to carry weight on their back. Their spines are not like horses, so please don't give your money to ride an elephant because it's just not natural for them and when they are forced to do this kind of work they are not treated well. They’re just being used for human gratification. If you are going to Thailand, check out the sanctuary instead of going for a ride. We paid $75, and it was so worth it! We highly recommend that you do it. In addition to having a great time there, the money raised from the visits helps the sanctuary take care of the elephants (food, veterinary care, and infrastructure). The price also includes drinking water and a Thai buffet. After 10 beautiful days of relaxation, we headed back to Paris to get back to work before our next trip which was already planned. Next, it’s off to Copenhagen!